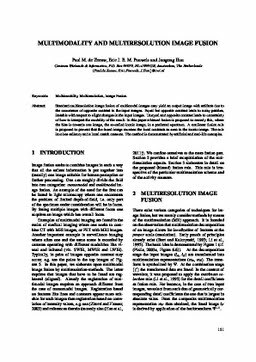 Standard multiresolution image fusion of multimodal images may yield an output image with artifacts due to the occurrence of opposite contrast in the input images. Equal but opposite contrast leads to noisy patches, instable with respect to slight changes in the input images. Unequal and opposite contrast leads to uncertainty of how to interpret the modality of the result. In this paper a biased fusion is proposed to remedy this, where the bias is towards one image, the so-called iconic image, in a preferred spectrum. A nonlinear fusion rule is proposed to prevent that the fused image reverses the local contrasts as seen in the iconic image. The rule involves saliency and a local match measure. The method is demonstrated by artificial and real-life examples. de Zeeuw, P.M, Pauwels, E.J.E.M, & Han, J. (2012). Multimodality and Multiresolution Image Fusion. In G Csurka & J Braz (Eds. ), Proceedings of International Conference on Computer Vision Theory and Applications 2012 (1) (pp. 151–157). SciTePress.